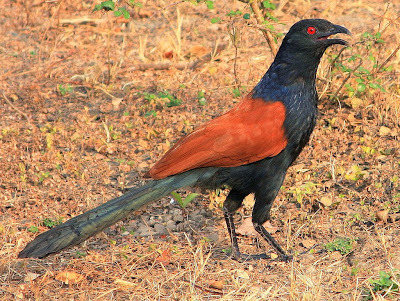 Greater coucal Centropus sinensis, photographed by Michael van der Linde. Centropus includes the coucals, medium-sized to large, mostly terrestrial cuckoos found in the Old World tropics. Coucals build bulky domed nests on or near the ground, and the males often provide the majority of parental care. Characters (from Austin 1961): Mostly dark; 12 to 30 inches in length; feathering stiff and sparse on head, neck and breast. Bill stout, down-curved; wings short, rounded; tail long, rounded; legs long, heavy; hind toe with long, sharp, straight claw, as long as or longer than the toe itself.